If you are looking for a great way to improve your core strength and muscle tone, but haven’t the chance to get over to the gym, don’t worry. 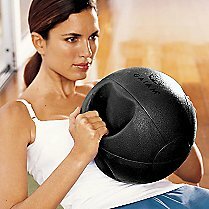 There is a wonderful weighted ball you can pick up at most retailers like target.com or specialty stores like Gaiam.com. These weighted balls, also referred to as medicine balls, allow you to do many core and strength training moves quickly developing, lean, tone muscle mass. Gone are the days of the big, bulky, heavy weights. Pick up a weighted ball and fit your crunches in today! I have found after short use of my crunches with the weighted ball my abs toned up and leaned out much faster then previously with standard sit ups. With the weight doing the majority of the work you barely need to move much to do this exercise correctly. Incorporate side to side moves for a nice quick oblique exercise. Of all the fancy training I do, and have done at the gym, this small little weighted ball seems to have won me over. If you are looking to quickly trim your mid-section in time for summer, add these simple moves into your week. Incorporating these simple moves just 3 times per week will lean out your mid section with results you will see right away. This exercise is also much safer then big, bulky, heavy gym weights. These balls also travel well and can be found with a pump so that you can easilly inflate and deflate for simple portability. Where there is a will….you can find and make a way! Excuses only excuse you from your success, don’t interrupt your progress, simply find what works for you and make it happen now!